Billy Maddox planted 100 acres of Roundup Ready soybeans this year without having to pay Monsanto a dime. It has been 20 years since Monsanto developed its first genetically modified crops. Now, some of its early patents are starting to expire which is leading to the first "generic GMOs" off-patent seeds that cost half as much and which farmers are free to save and replant. Maddox, speaking in a Southern drawl as he drove down a road somewhere near Jonesboro, Arkansas, is a seed dealer who works with conventional varieties. This year was the first time he sold any GMOs. From the acres he planted, he was able to collect thousands of bags of seeds genetically engineered to resist glyphosate, the weed killer Monsanto markets as Roundup. "We cleaned it, bagged it and sold it. I tried to make a little bit of money," Maddox said. "Oh yeah, the farmer saves money. If they buy it from me this year, they can plant for themselves next year." When the patent on a blockbuster drug ends, cut-rate competitors jump in and steal market share. It remains too soon to say if something exactly like that will happen with GMOs. "We've gotten calls from all over the country, but how big a deal it's going to be we still don't know," Donald Dombek, director of the University of Arkansas Crop Variety Improvement Program, said. The program developed the seeds Maddox has been selling. 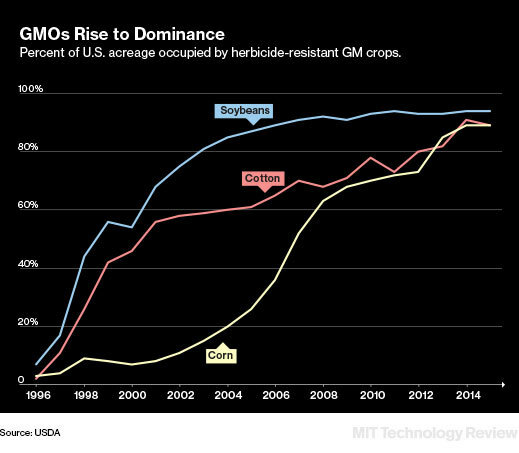 The GMO market is big enough for competition, and it might need some more as over 90 percent of soybeans grown in the U.S. are genetically engineered with Monsanto's Roundup resistance genes. By the bushel, it's easily the most important biotech product ever. Monsanto says it does not have worries concerning the patent expiration. It developed a new version, Roundup Ready 2, several years ago that it says works better and whose patents are still in force. A third generation is pending approval. The generic GMOs planted by Maddox were developed at the University of Arkansas by plant breeder Pengyin Chen, who spent several years mating plants in order to move the Roundup resistance gene. The gene originated in a bacterium from Monsanto's seeds into a different type of soybean in development at the university. The resulting variety is called "UA5414RR," and so far the university has sold 2,400 bags mostly to seed dealers who are growing more of it. Each bag weighs 50 pounds, holds about 140,000 seeds and is enough to plant 1 acre. Because there are 84 million acres planted with soybeans in the U.S., the market share claimed by Arkansas' seed is tiny. But other agricultural universities are launching their own generics, including Kansas and Georgia. The University of Missouri, in Monsanto's backyard, is preparing four knockoffs to sell this year. Farmers who want to plant off-patent GMO seeds will still need to check that they aren't encumbered by other restrictions. Apart from genetic engineering, any new plant variety can also be patented. Arkansas plans to file such a patent on its new soybean, but says it will not stop farmers from saving seeds. The chance to get Monsanto's invention without paying extra for it will be a relief to some farmers. The St. Louis company is not popular after suing at least 147 of them for saving seeds. Two years ago, an elderly Indiana farmer named Vernon Bowman appealed all the way to the Supreme Court, but lost. The justices ruled 9-0 that he had no right to reuse soybean seeds without paying. The patents he violated are the same ones that expired last year. Chen says he created the new variety to give farmers a choice. Prices paid for soybeans are at a four-year low, and they need to save money. The Arkansas seeds cost $25 a bag, half the price of Monsanto's newer ones. "People ask me, why are you bothering with this old technology," Chen said. "I think it's still usable, so why not. You can manage it the same, and you pay half the price. I think it's a good thing for farmers. It's not a threat to anyone." Big seed companies are switching to Roundup Ready 2. They say the older trait had problems that led to lower yields and they caution that university varieties aren't competitive. Even if the off-patent seeds were free, said Harry Stine, head of Iowa's Stine Seeds, farmers would still lose money by growing fewer beans. "There isn't anyone who can add and subtract who'd buy the cheaper, lower yielding materials," he said. "But there are people who can't add and subtract, and so they will sell some." Jack Kloppenburg, a sociologist at the University of Wisconsin-Madison, said GMO generics mean farm-state universities are playing Monsanto's game instead of coming up with new ideas. But he says generic versions could at least get farmers out from under what he calls the "monopolistic practices" of big seed firms. Yet generic versions could raise tricky questions for people used to criticizing GMOs. In 2012, Kloppenburg helped start the Open Source Seed Initiative that established a repository of freely available seeds. One of its board members, Irwin Goldman, says he is not sure if they would allow a transgenic plant into the seed bank. "We could have an open source GMO, but we would have to think about it, because people interested in open source seeds are also people who support organics," he said. "It's not a natural affinity." According to Matthew O'Mara, an official with the Biotechnology Industry Organization, in Washington, D.C, starting in the next decade a wave of important plant genetic modifications will lose patent protection. That's been a looming concern for companies, he said, because of how biotech crops are regulated. China, which buys one in four soybeans grown in the U.S., asks that genetically modified traits be re-registered every three years, he said. In Europe, it's every 10 years. Because of the way soybeans get mixed up in grain elevators and crushers, if approvals for older products lapsed, all exports could be compromised. "There is a full supply chain out there. You don't want a China trade disruption," O'Mara said. Although it doesn't sell the older Roundup beans anymore, Monsanto has said it will keep the regulatory files up to date through 2021. After that, keeping things on track may fall to an industry group set up to track expiring patents. Next time we write about Monsanto Company, we'll email you a link to the story. You may edit your settings or unsubscribe at any time.